Yes you read that right but it’s not what you are imagining. Banish the thought of lamingtons and coconut ice. Forget about syrupy koesisters you find at your corner shop. This has nothing to do with dessicated coconut and everything to do with coconut flour. In my quest to eat healthier I discovered this curious ingredient. At first it was as common as hen’s teeth. When you googled it you discovered it’s available almost anywhere, in the USA. Some places stocked it in South Africa…if you lived in JHB but Cape Town was not keeping up. I went to every health store and dischme, wellness warehouse and even a few regular stores and every one looked at me with “oh you’re one of those paleo freaks” looks or just a “the who what now” expression. Now it is easier to find with most Health Stores stocking it and an SA company making it. You can check out SOMAMA, they unfortunately don’t sell to the public directly (no matter how much I begged) but they have some very interesting information on their site. I decided to start experimenting with the coconut flour I had found but true to form, I had a million ideas when I couldn’t find the stuff and now that I had it I had no ideas at all. Months went by and finally I had settled on idea. 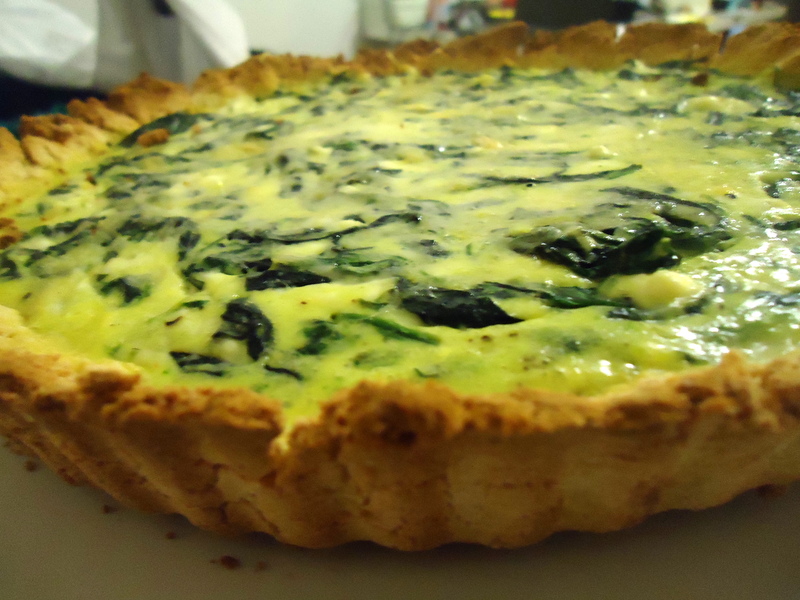 I wanted quiche and I wanted to try it with a coconut flour crust. I wasn’t too simple, or too complicated. A common item made by almost every and loved by, well almost, everyone. I did a classic, spinach and feta. The filling was basic and you can fiddle with it any which way you like. Whisk together the eggs and milk. Put in the spinach and feta and mix well. Taste and season liberally. Pour into crust and place into the oven until set.